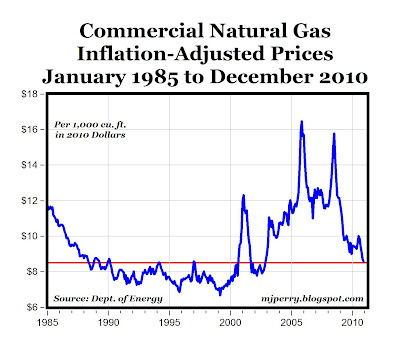 CARPE DIEM: Real Residential Nat Gas Prices Fall to 8-Year Low, Commercial Prices to 9-Yr. Low; Where's the News? Real Residential Nat Gas Prices Fall to 8-Year Low, Commercial Prices to 9-Yr. Low; Where's the News? 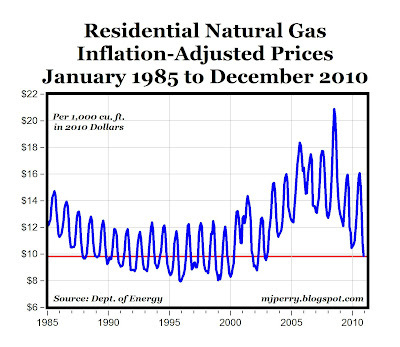 The top chart above shows monthly, inflation-adjusted prices for "U.S. natural gas delivered to residential customers" (data here, prices are in 2010 dollars). 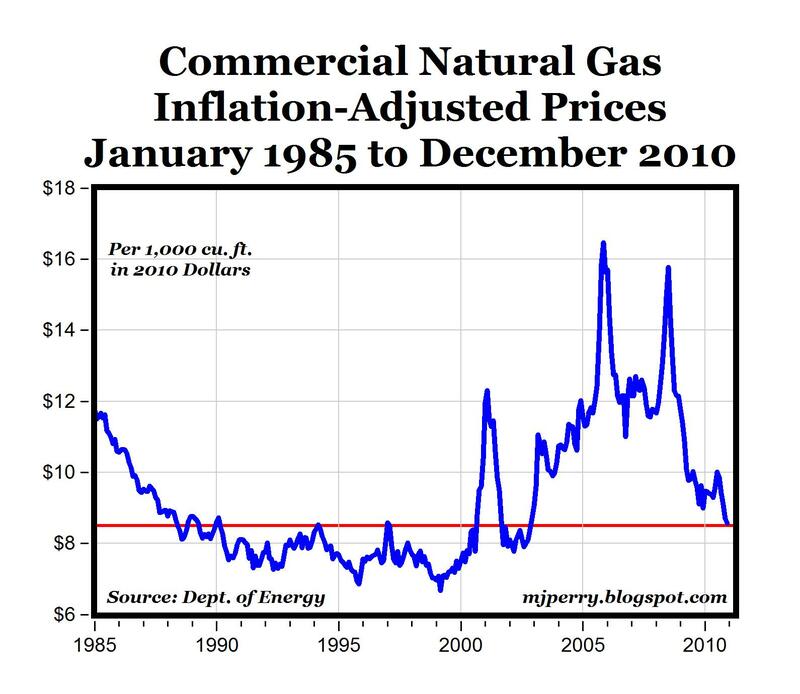 The price of natural gas in December 2010 at $9.86 per 1,000 cubic feet, was the lowest price in almost 8 years. 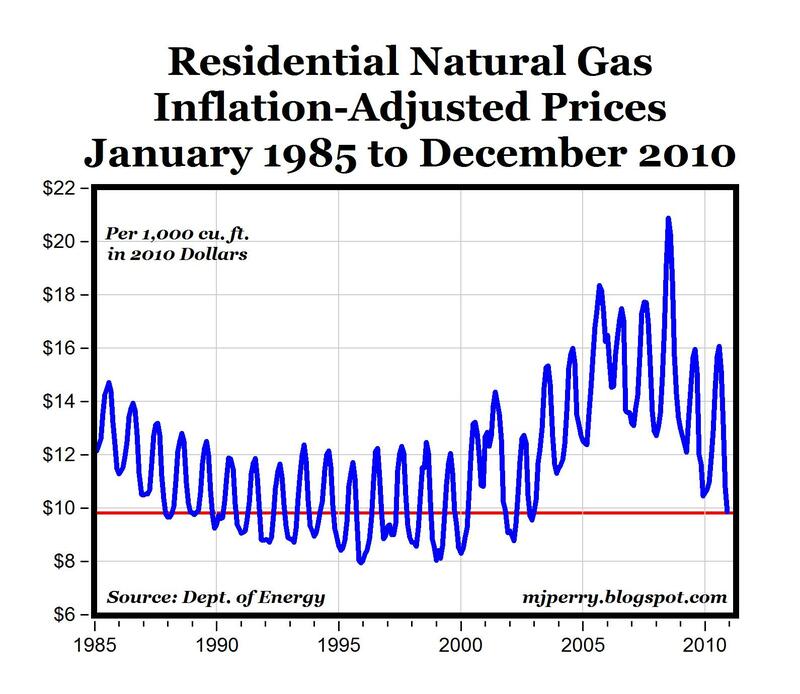 You have to go all the way back to January 2004 to find a lower inflation-adjusted price for residential natural gas. The bottom chart above shows monthly prices for natural gas sold to commercial consumers (data here). For those customers real natural gas prices are even lower today in inflation-adjusted dollars than for residential customers. The December 2010 price of $8.54 per 1,000 cubic feet was the lowest inflation-adjusted price since November 2002, more than nine years ago. While rising gas and oil prices, along with concerns about rising inflation in general, have captured all of the media headlines recently, the real price of residential natural gas has quietly fallen to an 8-year real low in December 2010 for residential customers and a 9-year low for commercial customers. I couldn't find a single news story about this, demonstrating once again that "bad news sells" and good news is often ignored and overlooked. You heard it here first! Kudos to Mark Perry on this one. We have some Fed officials, such as Richard Fisher, who seem to have the screaming meemies about inflation, and cite oil prices, commodities etc. Some people have made a secular religion about inflation. BTW, the CPI is now virtually unchanged from where it was in August 2008. You read that right. We are where we were 30 months ago--while there is hysteria about inflation. Actually, the Fed should be blowing the doors wide open. Japan is the scenario most to fear. Aorod--And they are drilling on US soil, where we do not have to have several aircraft carriers lurking about at the cost of a few hundred billion dollars a year. Funny thing about aircraft carriers--you can't use them as oil tankers, pump oil with them, or convince anybody their religion is a bit too fevered. If Saudi Arabia goes Libya, what good will the aircraft carriers be? It would be hard to devise a more false or expensive sense of security than that of our overseas "defense" archipelago. "It would be hard to devise a more false or expensive sense of security than that of our overseas "defense" archipelago." No, the defense archipelago has kept Benji secure, from foreign attacks, his whole lifetime.